Even though I am a stay-at-home mom, running errands still takes up far too much time out of my day. When it came to homeschooling my kids the hardest part was trying to find time to do it because it seemed like something always came up! There was always something that needed to be picked up, some new errand to be ran. That’s why I had to get serious about simplifying my method. 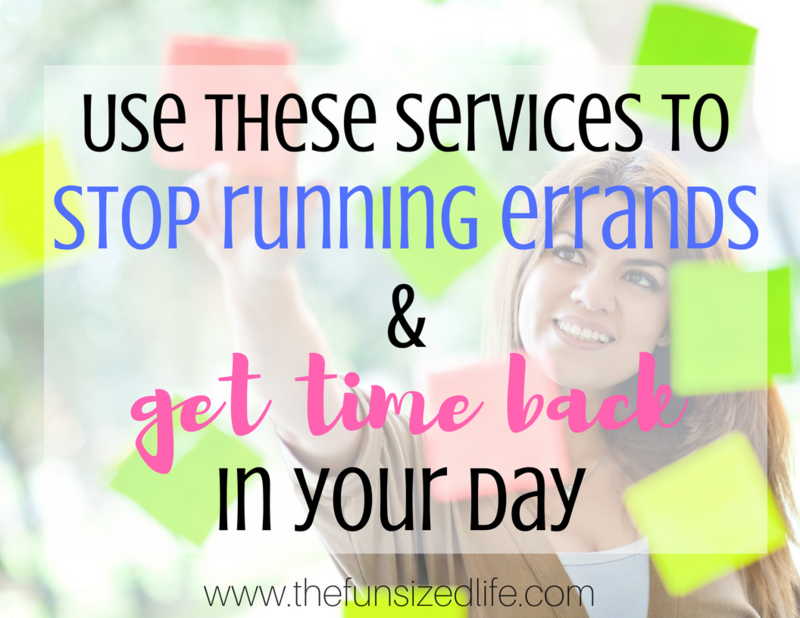 Thankfully, in today’s day and age, there are short-cuts all around us to help us keep up with our busy schedules. I wanted to share with you some time saving hacks you may not have known about. These things are designed to help you stop running errands so you can get time back in your day. *This post contains affiliate links. I may make a commission off any recommendations but all opinions are my own. When I was running my own photography business, I was spending so much time at the Post Office sending photos out to clients. This was especially tiring when my kids were younger. Now you can print postage labels at home to cut back on time! But did you know you can also just avoid the Post Office all together? The United States Postal Service will now pick up your packages right from your front door! Just imagine the peace around Christmas when you don’t have to stand in line and face the crowds just to send your family members their gifts! This is a newer errand in my household since I now have a husband and daughter who need their monthly prescriptions refilled. Usually I opt for Walgreens because I really appreciate the convenience of their drive thru system. While the drive thru is convenient and definitely saves me the hassle of dragging my kids into the pharmacy, did you know you can skip this errand all together? Just like so many things these days, the pharmacy is now coming to you! You can get your prescriptions delivered right to your door at no additional cost! If you are one of those people who find yourself having to cut out time each month to pick up and renew prescriptions, this is the perfect way to get time back in your life! Sign up for free. Can you hear the angels singing? I know it can’t just be us moms that dread going to the grocery store. Not only does it take a big chunk of time out of your day, but you inevitably spend too much and still leave without the thing you came for. Right? Thankfully, many major chains like Target, Walmart and even Costco have caught on to the struggle and now offer delivery or pick-up services! On top of that, companies like InstaCart will send someone to do all your shopping for you at whatever grocery chain you normally shop at! There are also a ton of online options to order your groceries through. My personal favorite is Brandless where everything is $3! They offer a wide variety of organic, gluten-free, vegan and non-GMO products and everything is $3. Plus, you can use my code to get $6 off your order. Not everyone is designed for meal planning, I get it. It can be tough knowing what to cook or what to shop for which is why a lot of people just grab stuff off the shelves at the grocery store with any real plan in mind. If this sounds like you, don’t worry, because all the guesswork can be taken out of this daunting task too! The $5 Meal Plan is easy to use, healthy meal plan and grocery list that literally does all your planning for you! It was created by a busy mother of 4 and is designed to help other busy, on-the-go families get healthy food on the table with ease. 4 Ways I Could Have a Spotless home, But I Don’t Want To. It seems like more and more restaurants have jumped on board with the idea of letting you order food and then take it home and I am oh, so thankful for that. Side note: Did you know you can order just the Cheddar Bay Biscuits from Red Lobster? It’s true. But what if you are burnt out from all your other running around? Don’t want to face the5 pm rush hour? That’s what UberEATS is for! Get signed up for UberEATS and they will deliver food from your favorite local places! See if they are delivering near you. As a former bank teller, I should probably be worried about the convenience of ATM deposits and withdrawals. However, if I’m being honest, I usually choose the ATM myself. It’s just faster, easier and my kids don’t beg for suckers from the back seat. To make it even less time consuming, most major banks have jumped on board with making deposits using your smartphone! You can just snap a photo of your check and it gets deposited into your account! Make sure to check with your local bank to see if this is a service they offer! We definitely live in the digital age and they are finding more and more ways to help people upgrade to digital. Sometimes this is exhausting and feels like we’re always stuck behind screens and other times, it’s just crazy convenient. Going paperless is the new big idea these days. Pro organizer, Abby Lawson and her husband Donny even created The Paperless Home guide and ebook to help teach others how to create a paperless home with ease. There is a great system for getting all of your important paperwork at your fingertips. If you are out and about and need your insurance card, you’ve got it! That old receipt? Right there. If you have your smartphone with you, you can easily access all of your important papers. Plus, you know I’m a fan of living a clutter-free home, right? Check out The Paperless Home. Whenever you have errands to run, the best way to do it is just to have an awesome plan of attack. Pick that perfect time of day, choose a route that will ensure you’re not driving in circles and have all of your stuff ready to go!